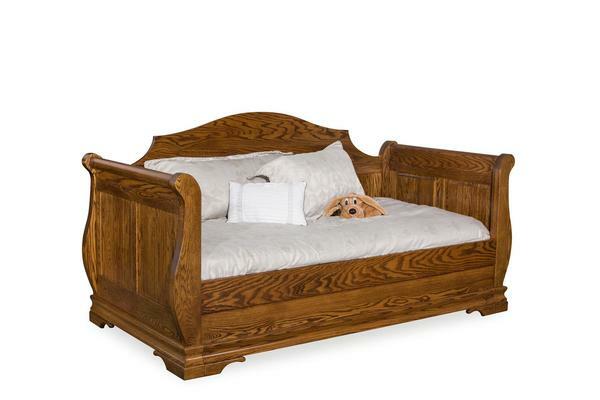 The Amish Sleigh Day Bed performs double duty, serving as a seating place and also a place to sleep. Equip your guest bedroom or living room with this handcrafted bed serving as an attractive solution to create an extra place for a guest to rest. The ends of this Amish made bed are curved gracefully, resembling the shape of a sleigh. Choose from nine wood species as well as rustic wood options. Rustic woods come standard with filled knots, but they can be left open if preferred. Select the perfect stain to match your decor. Add on a matching trundle (as shown in the second image) for another resting spot for guests! We offer stain samples to work with at home so you can match this day bed with your other furniture. Browse the best collection of solid wood Day Beds Amish made in America. At DutchCrafters, we make shopping for custom furniture easy, and all from the convenience of home. Order online, email or call one of our Amish Furniture Specialists today at 866-272-6773. A sampling of our fine Amish furniture is on display at the DutchCrafters Furniture Store in Sarasota, Florida. Depth of Inner Area Without Ply Base (Where Mattress Will Sit): 4 1/8"
Depth of Inner Area With Ply Base (Where Mattress Will Sit): 3 5/8"
Floor to Top of Ply Base Height: 11"
Floor to Top of Slats Height: 10 1/2"